The spring months are upon us and as the winter begins to thaw away, you’re going to need an amazing tractor that can help you get all the work done that you need to complete in your yard and on your land. When you’re thinking about which Kubota tractor you should choose, you need to think back to what you didn’t have last year. Did you have a tractor that can use several attachments that can be included and put on the tractor to get work done? If not, the BX23S is the model that will give you the ability to get the work done. 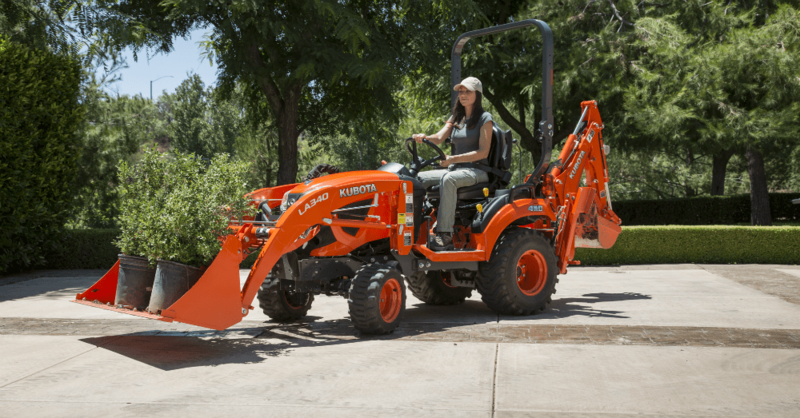 What is the Kubota BX23S? This amazing tractor has been meticulously engineered to offer you the legendary reliability and value that comes with having a tractor that will last you a long time. The BX23S is an innovative machine that makes it easy for you to remove snow, take care of your lawn, move dirt, mow a field, or perform any other work that you need to complete on the land that you care for. With this tractor, you’ll get everything done that you need to. The BX23S offers you a flat operating station with tilt steering and a seat that has armrests to give you the comfort you need when you take it out and get work done. The levers have been placed where you need them to give you the chance to control the drive and get more done when you’re ready to put this tractor to work on your land. Whether you need to dig a hole, push some dirt or snow around, or mow the yard, this tractor can do it all and it does so at a size that makes sense for you. Kubota has made it easier than ever for you to be able to attach or remove your attachments. All of the attachments can be put on or taken off the BX23S in a minute or less. There’s a single lever hydraulic connection that allows you to connect all four front loader hydraulic lines at one time. You’ll also find the flat faced no-spill couplers that allow you to connect the attachments much easier than you would on a traditional tractor. The curved boom design also allows you to have better visibility when you need to perform front loader work. Where Can You Find the Kubota BX23S? If you’re looking for a tractor that can get everything done that you need to accomplish, you need to take a look at this durable and dynamic tractor at Jeff Schmitt Lawn & Motorsports today. This is where you’re going to find the right tractor to give you the ability to get the job done that you need to when you’re ready to get to work. Come in and take this tractor for a ride and pick up the attachments that will help you enter spring with the right tools.